Description: Take to the sea, and find Polly, the Parrot Pirate King flying over his vast fortune of gold and silver! Polly has been playing checkers with his crew on this stranded island for months now, and he can't wait to get out onto the open ocean again to wreak havoc on the merchant ships passing over the waves! The sun is shining and the crewmen are ready for raiding and jaunty pirate songs! Instructions: Use your mouse to click on and through the floating hair, clothing, and accessory options for this parrot. Aarrrgg! 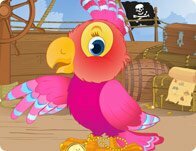 This pirate parrot is back from an adventure with his buccaneer buds. Celebrate their conquest with a colorful new plumage and some blinged out pirate gold.